Life is not a matter of milestones, but of moments. Two weeks and 2 days after Typhoon Ondoy, our house in Dela Costa Homes in Montalban is still covered in mud. Our neighbors are slowly re-building their lives, and discarding most of their muddy belongings. I wonder how the girl who owns this feels? I am still trying to get my blogging-groove back. After having hit by Ondoy in two houses, in Quezon City and in Montalban, I still can't concentrate much on blogging. I hope you recover soon from the shock and problems brought by Ondoy. Typhoon Ondoy has not only wrecked properties, it has ravaged the hearts of those affected. But the Filipino spirit is resilient, so I'm sure makakabangon tayong lahat. come visit my place if you have the time! This is such a sad situation. I cannot imagine what it must be like. Please know that we will be thinking of you. I hope that things will be better for you and those in your town soon. 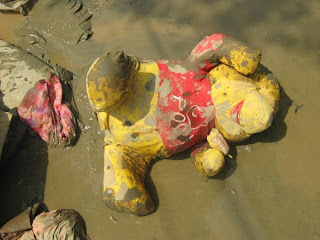 Ohhh poor pooh, his owner must be missing him! Here is my first mellow yellow entry. Hope you can take a peek! sad :( hayyyzzz i just hope that soon this will be over..
Is it My Turn with the Remote Yet? Help Jack On His Quest! Social Problem issues no more?